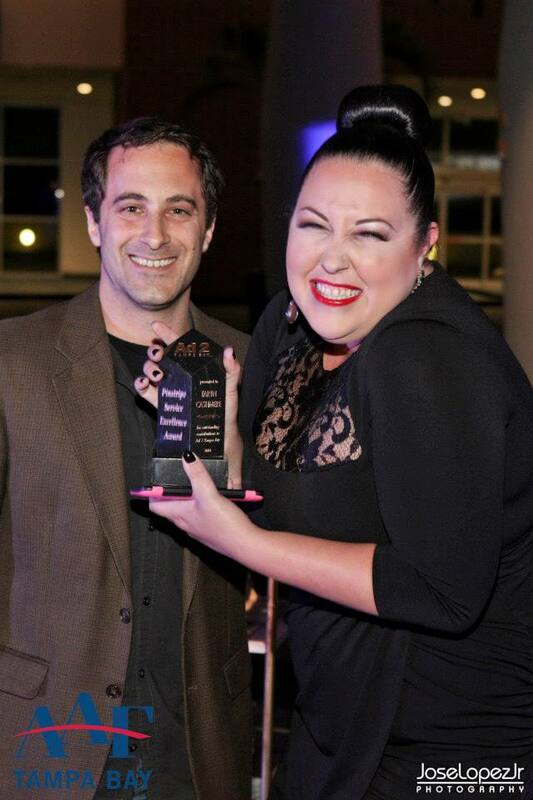 Ad 2 Tampa Bay’s immediate past president,Taryn Cashmere, received the 2014 Pinstripe Service Excellence Award at the American Advertising Federation – Tampa Bay Chapter’s ADDY Awards held on February 26 at Port Tampa Bay. Presented annually by past recipients, the award recognizes the Ad 2 member who demonstrates the most outstanding contributions to the organization. Cashmere has enjoyed many successes during her membership in the organization, including mentoring several students, raising thousands of dollars in sponsorships, introducing the new internship speed dating events, and coordinating the Cynthia Bentley-DeNight Memorial Fund to start two new student ad clubs. As president of the chapter, she earned a first place finish in the National Ad 2 Public Service Competition for their pro bono campaign on behalf of The Abolish Movement to end human trafficking and was recognized as National Ad 2 Club and President of the Year. She is currently a multimedia account executive for the Tampa Bay Business Journal. Past winners are Devon Pero (’04), Vinny Tafuro (’05), Jeff Morrow (’06), Jessica McDonald (’07), Carl Vervisch (’08), Kate Whatley (’09), Mike Compton (’10), Tamara Whittaker (’11), Amanda Page (’12) and Robyn Walters (’13).